Another example of how amazingly acute Point & Clickbait’s satirical articles are. 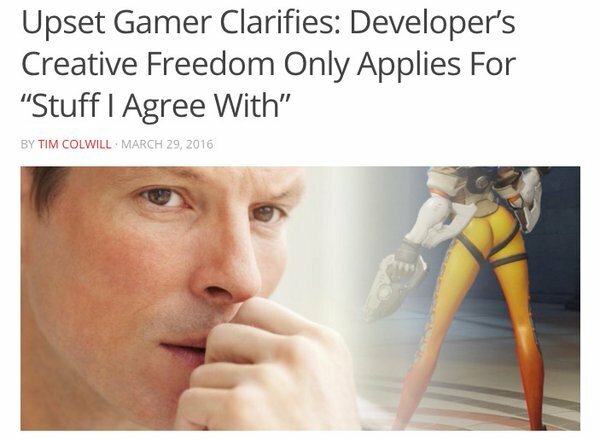 Let’s take a moment of thoughtful appreciation for the fact that they devoted an article to concisely sum up a huge chunk of our “creative freedom” tag. The ongoing saga of people getting outraged that Blizzard uses their beta period as a beta period and adjusts the game. 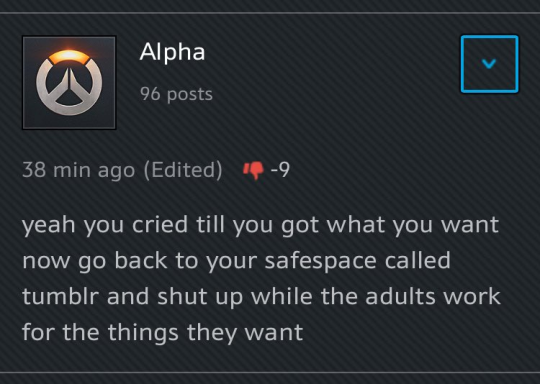 It’s worth mentioning that Blizzard also removed a tasteless masturbation joke at the same time. Perhaps one day, Blizzard will be the kind of company who upon declaring their game is to improve representation will fix these issues before they publicly showcases a beta with finished art. Ordinarily we wait longer before we bring back posts but it seems that there’s been a recent event involving a certain product we post about from time to time, and the response by certain demographics has been woefully predictable. In case you missed it: Blizzard has revealed via a comic for people who enjoy Overwatch and want more fluff (x): Tracer lives with her female romantic partner. How did the aforementioned demographic reply? So yes, predictably it turns out that the people who are used to being pandered to constantly don’t actually appreciate creative freedom – they just think it makes a cool catchphrase (or magic incantation in some cases). There was, however, a bright side: the response from women who celebrated that Overatch’s mascot character was confirmed to a lady attracted to ladies, and loudly reaffirmed their appreciation of as well as their right to representation. That was truly awesome.